The problem with not blogging regularly is that I come up with all these post ideas and things I need to tell you guys and then I never write about them. Then about a month later I decide I still want to tell you about it even if it did happen forever ago. So if you aren't interested in what happened a month ago, you should stop reading now. If you haven't discovered by now that I don't recap anything in a reasonable amount of time, then you seriously have not been paying attention. I'm too busy trying to catch up on Netflix shows or frantically read the 5 books that I checked out from the library before they are due in a week to stay on top of blog posting. 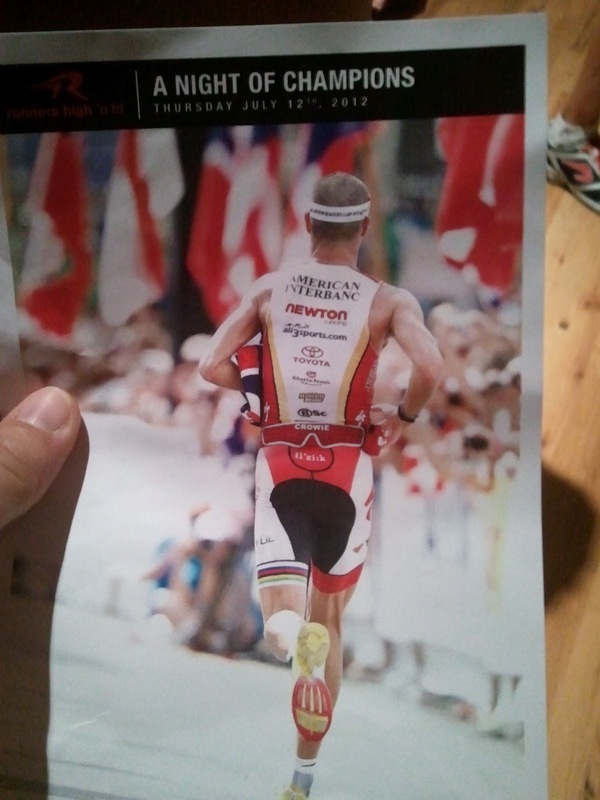 The Thursday night before my half Ironman--that's July 12th for those that don't have my personal calendar next to them--I purchased a ticket to go see some of triathlon's finest. 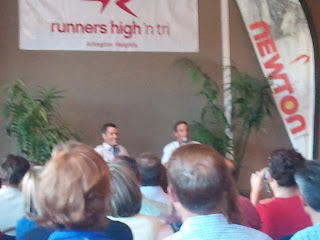 The even was hosted by my local running and triathlon store Runner's High & Tri in downtown Arlington Heights. 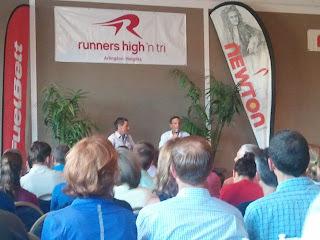 Basically Dave Scott did a little interview with Craig Alexander (affectionately known as Crowie in the triathlon world) and then question taking was opened up to the audience. It's possible that you have no idea who the heck these people are and that is totally okay because before I heard about this event I had relatively no idea who they were either. I had heard of both of them before, but that is pretty much where my knowledge dropped off. Dave Scott is a six-time Ironman World Champion (SIX!) and now trains and coaches other athletes in the sport including another triathlon great-Chrissie Wellington. Crowie is a three-time Ironman World Champion and is planning on racing at Kona again this year! Both of these athletes have very impressive resumes. It was an extremely interesting talk although I can't remember quite all the details anymore. Here are some of the interesting things I remember. When asked if he had any mantras he repeated or songs he sang to motivate himself during a race, Crowie responded that if you have enough energy to sing to yourself then you aren't working hard enough. Audience caught a glimpse of a story about a bad sunburn due to a aluminum foil wrapped sandwich. An audience member asked what time should his goal be for the Ironman marathon if his marathon PR is 3:38. Crowie responded with, "I don't know. 3:39." When asked if he thought if he could beat Crowie in his prime, Dave Scott pretty much avoided the question with statements such as "Equipment has changed so much in comparison to when I raced." In all reality, the bikes that professional triathletes use now are probably half the weight of the bike Dave Scott used. An audience member asked his thoughts on the Lance Armstrong steroid situation (Armstrong was planning on competing in the Ironman World Championship this year, but has been banned from completing while the steroid use investigation is going on). Crowie responded that although he does think the rule should be changed to not banning an athlete till he or she is found guilty of steroid use, changing it in the middle of the season for one athlete is unfair. In the past, an athlete has been banned from competing will under investigation for steroid-use and the rules were not changed then either. Crowie was also racing in the Racine 70.3! Dave Scott had some really great advice for races. He said sometimes athletes can get ahead of themselves thinking about what is coming up in the race, but it is important to just be in the moment. When you are swimming, don't worry about the bike or the run. Focus on where you are at that time. 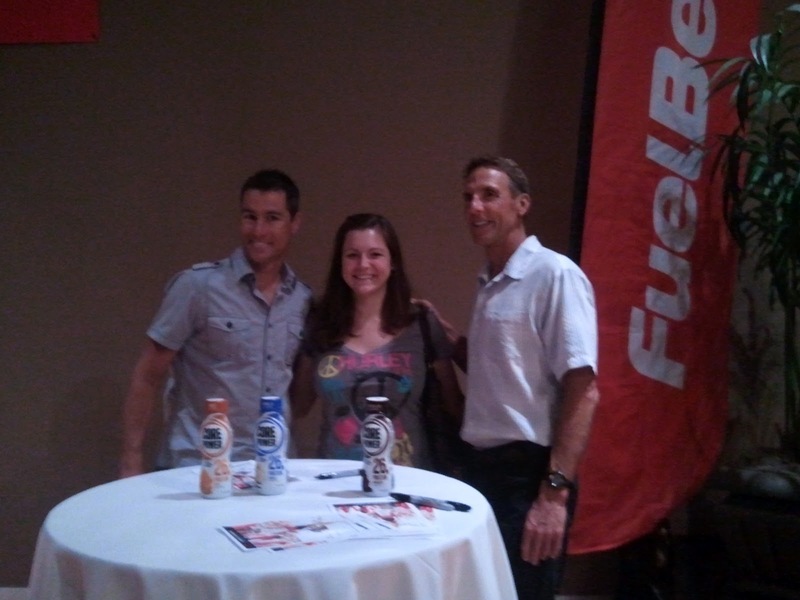 After the talk, audience members were able to get autographs and take a picture with Crowie and Dave. I was able to talk with them for approximately .5 seconds before snapping a picture and moving on. Overall, it was a neat experience and I really enjoyed it! And great motivation right before my big race!